With freight trains, flaming suns and the Futtless Rule, the Cosmic Wimpout dice game is truly one of a kind. If Douglas Adams, beloved author of the zany book the Hitchhiker's Guide to the Galaxy, had endorsed a dice game, this would be it. I can see his characters, Ford Prefect and Arthur Dent, inventing new Wimpout rules now. 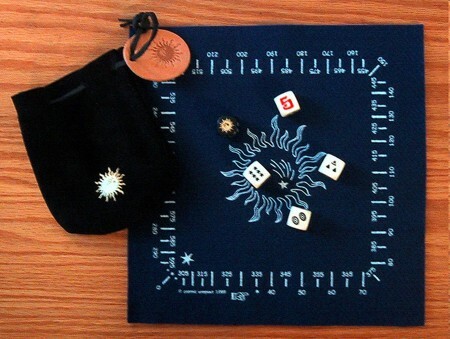 Cosmic Wimpout offers a refreshing twist on traditional dice games. The dice game instructions are written with a good dose of humor. For example, the rules state: "If you roll five 10's that is just Too Many Points. This is a Supernova. You are instantly out of the game." How many other games penalize you for scoring too many points? Exactly. You win by reaching the point total goal before your opponent. Points are scored by rolling 5's, 10's, flashes (3 of a kind) or five of a kind (except 10's).The Futtless Rule and the "re-roll rule" force players to keep rolling when they'd rather stop. If you cannot score, you "wimpout" and lose your points for that turn. The "Guiding Light" rule allows players to invent new rules; in the middle of the game! Of course, all players must agree to the new rule. This option injects creativity, quick thinking and imagination into the Cosmic Wimpout dice game. There's one black die in the set of five dice. You could propose the "Filthy Five" rule, wherein players must subtract five points should they roll a "5" with the black die. Basic rules state that would earn you five points. How about the "42" rule in honor of Mr. Adams' Hitchhikers Guide? Any player who rolls the dice and does not score, but has a "4" and a "2" can re-roll without wimping out and losing points. I suggest that you visit the official web site for the game and read the basic dice game instructions to learn how to play. The Cosmic Wimpout FAQ page will help answer burning questions, like "What the Heck is Cosmic Wimpout?" and many others. Ready to play? Great! Get your own copy of the Cosmic Wimpout dice game warm up your imagination and have some fun!